Citation: Amit Garg, Vimal Mishra and Hem Dholakia, 2015. 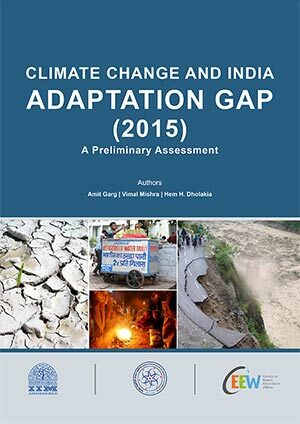 Climate Change and India: Adaptation Gap (2015) - A Preliminary Assessment. Working paper of Indian Institute of Management Ahmedabad (IIMA) W.P. No. 2015-11-01. This study identifies preliminary gaps in India’s adaptation to climate change, and highlights the financial, technological, institutional, and capacity building needs to fill this gap. 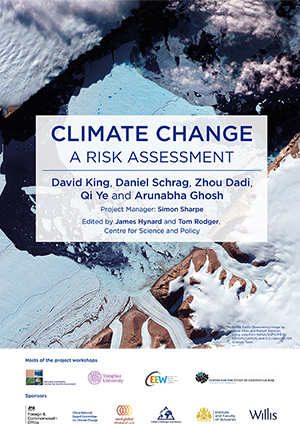 Conducted jointly with the Indian Institute of Management - Ahmedabad and the Indian Institute of Technology - Gandhinagar, it tries to understand the adaptation India is already going through, and what it would have to prepare for in future, under projected changes in climate. The study estimates that as many as 800 million people living across nearly 450 districts in India are currently experiencing significant increases in annual mean temperature, going beyond the 2°C warming pathway. India’s vulnerability to climate change impacts is profound since around 650 million Indians are dependent on rain-fed agriculture for their livelihoods; around 250 million Indians live along a 7500 km of coastline that is at high risk due to sea level rise and extreme weather events; many of the 10,000-odd Indian glaciers are receding at a rapid rate; and deforestation is happening. India as a whole, will experience 1-1.5°C increase in mean annual air temperature in the near term (from 2016 to 2045), which could have profound implications for agriculture and crop production. These effects could be further pronounced given the estimated increase in extreme precipitation events, resulting in flooding and significant damage to infrastructure. India would need over USD 1 trillion from 2015-2030 to adapt to the adverse impacts of climate change. Total government spending on developing capacity and adaptation in India has grown consistently over the last decade, with USD 91.8 billion being spent on adaptation in 2013-14 alone. This spending would have to reach USD 360 billion (in 2005 prices) by 2030. The loss and damage from extreme events are estimated additionally at USD 5-6 billion per annum. India’s Nationally Determined Contribution (NDC), submitted in 2015, reiterated the need for better climate change adaptation by enhancing investments in development programmes in sectors vulnerable to climate change, particularly agriculture, water resources, Himalayan region, coastal regions, health, and disaster management.